"Commemorating Americas' Armed Forces and Their Affiliation With The Units They Serve/Served Within." THE CLASSIC CERTIFICATE DESIGN - All graphics and text are printed using a high quality laser printer on heavy 65 lb, acid free ivory certificate paper. 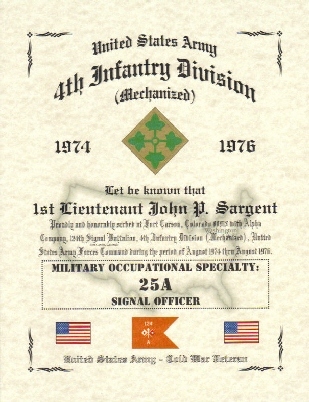 This certificate design includes United States Army and unit identifier with drop shadow lettering boldly displayed at the top of each certificate, unit shoulder sleeve insignia (SSI) or distinctive unit insignia (DUI), years of service or images pertaining to your MOS (applicable), full name and rank, map outline of duty assignment, main inscription describing your duty assignment, official Military Occupational Specialty (MOS) and (ASI), national flags (L & R) of duty assignment, your units official guidon flag with your units identification lettering, lower inscription displaying your era of service. The Classic is priced @ $21.99, please include $4.75 for S & H.
THE ART MAT CERTIFICATE DESIGN – All graphics and text are printed using a high quality laser printer on an art background, pre-printed, heavy 65 lb, acid free archival quality cardstock. 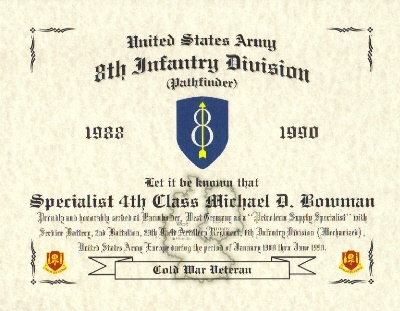 This certificate design includes United States Army and unit identifier with drop shadow lettering boldly displayed at the top of each certificate, unit shoulder sleeve insignia (SSI) or distinctive unit insignia (DUI), years of service or images pertaining to your MOS (if applicable), full name and rank, map outline of duty assignment, main inscription describing your duty assignment, official Military Occupational Specialty (MOS) and (ASI), national flags (L & R) of duty assignment, your units official guidon flag with your units identification lettering, lower inscription displaying your era of service. The Art Mat is priced @ $24.99, please include $4.75 for S & H.
THE SCROLL CERTIFICATE DESIGN - All graphics and text are printed using a high quality laser printer on heavy 65 lb, acid free ivory certificate paper. 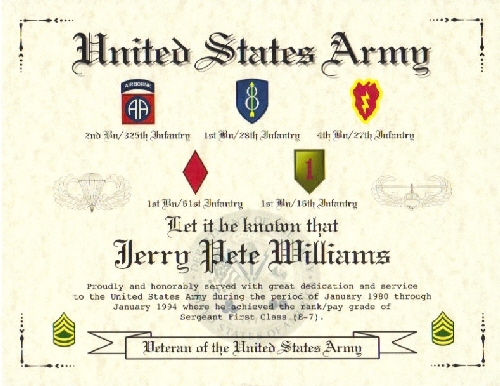 This certificate design includes United States Army and unit identifier with drop shadow lettering boldly displayed at the top of each certificate, unit shoulder sleeve insignia (SSI) or distinctive unit insignia (DUI), years of service or images pertaining to your MOS (if applicable), full name and rank, map outline of duty assignment, main inscription describing your duty assignment, lower inscription within a scroll displaying your era of service. The Scroll is priced @ $19.99, please include $4.75 for S & H.
THE CERTIFICATE OF SERVICE CERTIFICATE DESIGN – All graphics and text are printed using a high quality laser printer on heavy 65 lb, acid free ivory certificate paper. 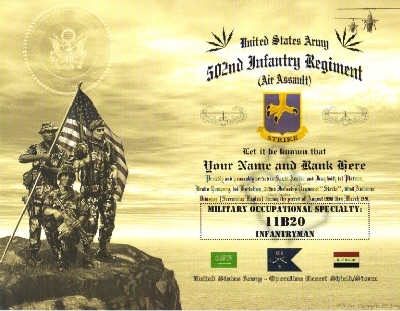 This certificate design includes U. S. Army and unit identifier with drop shadow lettering boldly displayed at the top of each certificate, unit location with city, country and zip code (if applicable), full name and rank, unit shoulder sleeve insignia (SSI) or distinctive unit insignia (DUI) boldly displayed in center of certificate under main inscription, unit’s motto (if applicable), images pertaining to your MOS (if applicable), lower inscription displaying years of service (L & R). The Certificate of Service is priced @ $19.99, please include $4.75 for S & H.
THE CAREER COMMEMORATIVE CERTIFICATE DESIGN - All graphics and text are printed using a high quality laser printer on heavy 65 lb, acid free ivory certificate paper. 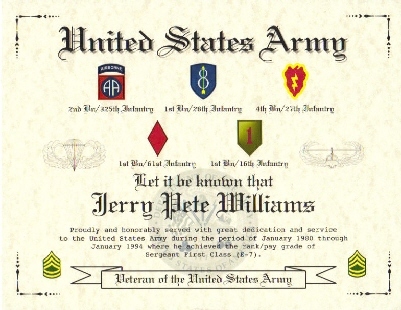 This certificate design includes United States Army with drop shadow lettering boldly displayed at the top of each certificate, up to 8 shoulder sleeve insignia (SSI) boldly displayed, full name, main inscription describing your career with ending rank and pay grade, images pertaining to your MOS (if applicable), lower inscription within a scroll displaying proud service. The Career Commemorative is priced @ $39.99, please include $4.75 for S & H.
After purchase, you send us your pertinent military information through our "Information Transfer Forms" located on every page of the USMDC Certificates website. Remember, you review and approve your USMDC Certificate before we ship! How Do You Send Your Service Information To Us? Please use the following link to access our "Information Transfer Form" that you fill in and send to us using the "Click Here to Continue" button. We then take your information, create a certificate, send you a link with a draft example for your review and approval, we then ship. What We Will Need To Create Your Certificate? You provide the like information below and we create your personalized, accurate and historically correct USMDC Certificate. Don't be shy with this information, remember the more information the better! 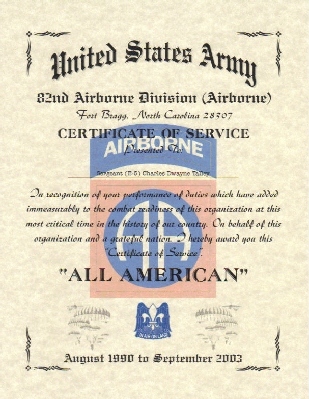 "Proudly and honorably served at Fort Bragg, North Carolina with 1st Squad, 2nd Platoon, Bravo Company, 50th Signal Battalion, 82nd Airborne Division (Airborne) during the period of September 1985 thru August 1988." We use all of the pertinent information you send to us to create a personalized, accurate and historically correct USMDC Certificate for you that meets your desired requirements. Don't See Your Unit Here? We Love Challenges! Contact Us Below. unit USMDC Certificate or for questions regarding special requests. 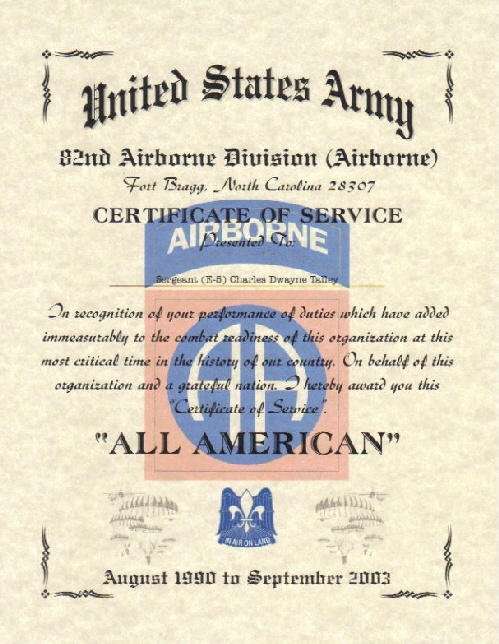 Links To Other Pages Of U. S. Military Display Certificates Below!